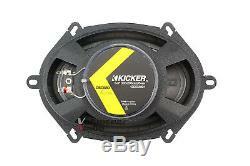 Upgrade your old speakers to higher quality aftermarket speakers. 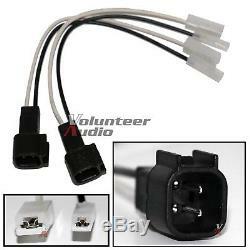 This package includes the speakers and speaker harnesses for a simple installation. 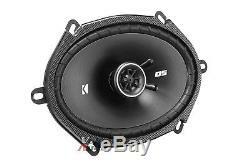 Please verify your vehicle's original sound system specifications before purchasing your package. We have information after the vehicle Fitment area (below) and in the vehicle Compatibility area (above - see the notes column on the left) that will show exclusions and/or exceptions to the stated vehicles. We also offer complete radio install packages to ensure you get every major component you need to make your installation as easy as possible. Please use the Vehicle Selector above to direct you to the vehicle specific parts and packages. 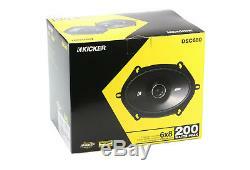 KICKER DSC680 DS Series Speakers. A drop-in coaxial upgrade with the flexibility to fit nearly any vehicles doors for a vast improvement over factory sound. 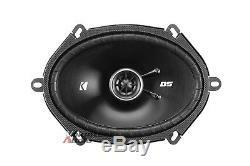 Featuring eight sizes, the speakers are designed to fit virtually every make and model of vehicle without modification. The midrange woofer's stiff, polypropylene cones and acoustic-foam surrounds provide optimal performance. The high-sensitivity motor structures of the woofers are made to deliver increased volume output despite lower-powered, factory head units, but they also handle the high power from add-on amps. Thin-profile woofers avoid obstructing car-window mechanisms and the 13mm polyethylene-naphthalate domed tweeters have zero-to-minimal tweeter protrusion. 90 dB at 1 watt. The industry standard speaker wiring harness eliminates the need for cutting or modifying any of your OEM speaker connections and can be easily reversed for reinstallation of your factory speakers at a later time if you decide to sell or trade your vehicle. This may help maintain your vehicle's value. All standard wiring harnesses are EIA color-matched to the aftermarket speaker wiring harness for easily identifiable connections. This install package ensures that you get every major component you need to make your installation as quick and easy as possible. Please feel free to contact Customer Service with any install or package questions at 1-844-30AUDIO, Ext. NOTE: We advise that you retain all factory screws or other fasteners when removing the factory speakers as these may be needed when installing your new aftermarket speaker kit. Depending upon vehicle configuration other fasteners may be required. The information provided is only to be used as a "rough" guide. Different trim levels and/or factory premium audio systems may cause your particular vehicle's specifications to differ from the specifications offered in this fit guide. Volunteer Audio recommends that you check your vehicle for proper fitment, or consult your professional installer, prior to determining your actual speaker size. 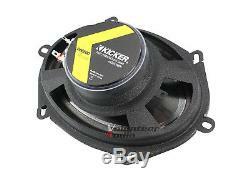 You should also consider the mounting depth, overall diameter, and cut-through diameter of the speakers to ensure that they fit properly without hindering operation of any windows or internal OEM parts. Volunteer Audio has been a family owned and operated, car-audio-installation and retail business since 2001. We are Authorized On-Line Retailers for the brands we sell. You are protected from receiving grey-market, damaged, or altered products that may be available at other stores or websites. Thanks to our loyal customers, business has grown! In addition to our experienced sales and customer service team, Volunteer Audio has MECP (Mobile Electronics Certified Professional) technicians and installers on staff to assist you with technical questions. Whether you are a first-time customer, or one of our many returning friends, we are committed to providing 100% satisfaction in products and service. Thanks for shopping with us! There will be two tracking numbers provided. At Volunteer Audio we want to make sure that you are 100% satisfied. Contact Volunteer Tech Support for authorization before returning any defective items. Items not in like-new condition, including but not limited to: items missing original product packaging, used items, installed items, abused or physically damaged items, items missing parts, damaged packaging and items damaged due to improper return packaging, and items with a different or defaced serial number. We will be happy to answer your questions or help you get the right part the first time. 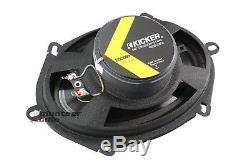 The item "Kicker DSC680 6X8 Speakers With Wiring Harness Fits Ford 2 Pairs 50Watt Rms" is in sale since Tuesday, December 15, 2015. This item is in the category "eBay Motors\Parts & Accessories\Car & Truck Parts\Interior\Interior Door Panels & Parts". The seller is "volaudio" and is located in Oliver Springs, Tennessee. This item can be shipped to United States.